Coast Guard as an organization has multiple tasks listed against its name. Life in Coast Guard is not only filled with excitement and adventure but also offers a lot of scope to learn and grow. Due to the multiple nature of tasks being performed by Coast Guard ranging from guarding the sea boundary of our country against any illegal immigrants, apprehending poachers, to assisting the fishermen in need at sea and at shore, to conserving the marine bio diversity the personnel receive tremendous amount of experience both in handling manpower and various equipments. Age for Assistant Commandant (GD): Candidates between 21 to 25 years of age are eligible to apply. Age for Assistant Commandant (GD) – Pilot: Candidates between 19 to 25 years of age are eligible to apply. Education: Candidate should hold a Bachelor’s Degree from a recognised university with minimum 60% marks in aggregate (ie. 1 st Semester to 8th Semester for BE/B.Tech or 1st year to last year for Bachelor Degree Candidates wherever applicable). Mathematics and Physics as subjects & up to intermediate or class XII of 10+2+3 scheme of education or equivalent with 60% aggregate marks in Maths & Physics. Education (Mechanical & Technical Branch): Engineering degree with 60% marks in aggregate or Should have passed Sections A and B examination from the Institution of Engineers (India) in any of the discipline listed below with 60% marks. (a) Engineering Branch Naval architecture or Mechanical or Marine or Automotive or Mechatronics or Industrial and Production or Metallurgy or Design or Aeronautical or Aerospace. (b) Electrical or Electronics or Telecommunication or Instrumentation or Instrumentation and Control or Electronics and Communication or Power Engg. or Power Electronics. At least 60% marks in aggregate in Physics and Maths in 12th class. or Three year diploma course with an aggregate of 60%. All the above streams of Engg. must be recognised by All India Council of Technical Education (AICTE). Education: A Degree in Law with minimum 60 % marks from a recognised University. Three years degree in Law after graduation or Five years after 10+2 examination. Short Service Appointments as Assistant Commandant for a period of 08 years, which may be extended to 10 years and further extendable upto 14 years. Education:12th class pass with 60% marks in aggregate and should possess current / valid Commercial Pilot License (CPL) issued/validated by DGCA on the date of submission of application. PS: Maximum 5% relaxation in aggregate in the degree certificate for SC/ST candidates, NCC ‘C’ certificate ( 'A' grade) holders, Sports person of National level (Inter State & above) and Wards of Coast Guard Uniform Personnel deceased while in service. No relaxation for 12th class marks. 1. Shortlisting of Applications: Short listing criteria will be based on higher percentage of marks in the qualifying examination and the qualifying cut off for a particular branch or centre may be increased from more than 60% if more applications with higher % are received. 2. Preliminary Selection Board: Shortlisted candidates will be called for Preliminary Selection at given date and time which will consist of Mental Ability Test/ Cognitive Aptitude Test and Picture Perception & Discussion Test (PP&DT). The aptitude test will be in English only and will be objective type. During PP&DT the candidates are expected to speak and discuss in English. However they are free to speak in Hindi if they wish to do so. Date/ time and venue of Preliminary Selection once allotted will not be changed at any stage. 3. Final Selection Board: The candidates qualifying above Preliminary Selection will be called for Final Selection. The date and venue for Final Selection Board (FSB) will be uploaded on Indian Coast Guard website www.joinindiancoastguard.gov.in. The Final Selection will consist of Psychological Test, Group Task and Interview (Personality test). 4. Medical: All candidates recommended by Final Selection Board will undergo Medical Examination at nearest Military Hospital. Candidates for GD (P/N) and CPL will undergo medical at AFCME, Delhi / IAM, Bengaluru. 5. PABT/CPSS: GD (Pilot) candidates on qualifying FSB will be required to appear for PABT or CPSS at Dehradun/Mysore AFSBs. Those already qualified PABT & CPSS are to provide details of batch, Chest Number and place while filling up PIQ forms during FSB. 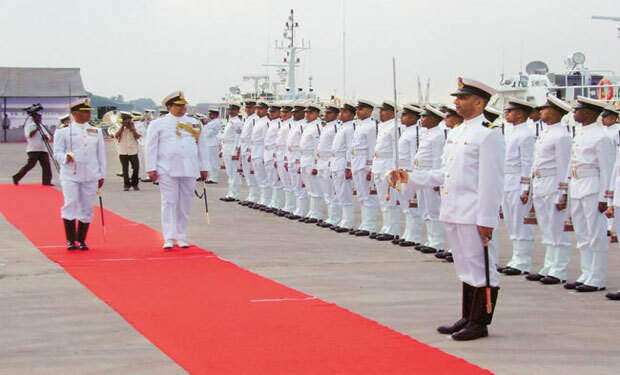 Cadets academy provides coaching for entrance examination of various types of sailor entries in Indian Navy. We have round the year coaching for these entrance exams. © All Rights Reserved 2017 - Cadets Academy | Designed & Developed By digigarage.